The university movement became visible with robust organization, political clarity and a large majority of the student population. They thus won popular support and their mobilization extended to the national level.? The student strike and vigil at the Rector’s office with the slogan #UnaNoTeCalles (UNA don’t be silent) began on Monday September 21 (welcoming spring) and continued up to the writing of this article. At this point in the development of activities of the organized student movement, alongside other actors from the university community and various social groups that support them, has led to the removal of a large part of the corrupt hierarchy of the National University of Asunción (UNA); a hierarchy tied to the old superstructure of power, beginning with the now ex-rector and convict Froilán Peralta and the ex-Vice Rector Andrés Amanilla. In addition, these actions have forced the resignation of Isacio Vallejos, ex-Dean of Engineering, Antonio Ramón Rodríguez, ex-Dean of Economics, Vicente Renna, ex-Vice Dean of Economics, Anibal Peris, ex-Dean of Medicine together with the whole Faculty Council and several professors, Juan Gualberto Caballero, ex-Dean of Veterinary Medicine, Mario Insaurralde, ex-Vice Dean of Veterinary Medicine, all members of the central campus of the UNA.? Moreover, Pablo Martínez, ex-Rector of the National University of Casaguazú (UNCA) and Hugo Recalde, ex-Vice Rector of the UNCA were swept out with the force of the mobilization. The student assemblies, that in some cases have become assemblies of all groups of the university community, including professors and workers, continue their demands for resignations of university authorities in their academic departments. In Philosophy at UNA a strike has been declared until the Dean, María Angélica González, resigns; the assembly of the Faculty of Law demands the resignation of the Dean, Antonio Fretes, who is also President of the Supreme Court of Justice, and the mobilization remains strong. “We call on everyone to continue and intensify the measures of an indefinite strike and permanent vigilance at the National University of Asunción, which is not only here at the Rector’s office, but also extends to other faculties, institutes and dependencies of the National University. This indicates that we are at the moment extending our plan to reform the university, and that precisely because of the autonomy that we have, we make a call for measures to purge our university”, these were the words of student leader Arturo Cano to the popular media outlet, La Cigarra, in the face of the futile and desperate attempts of the university administration to demobilize the protest. The student strike is not only having consequences for the corrupt authorities of the UNA, but is also attacking a problem that has been around for decades, that involves the degeneration of the student directorate, that in recent times has occupied roles of representation reproducing the scheme of corruption and privilege, placing itself at the service of the political parties of the dominant classes and turning their backs on the student body and their fundamental demands. In the Faculty of Law, the assembly insisted on the resignation of the president of the Student Centre and of the student representatives, as also happened in Medicine, and in Engineering where the students made the same demands, as they also did in Economics, all of which adds up and continues to produce changes in the student leadership. Many speak of the apathy that was affecting the student corps, and see this great mobilization as an extraordinary phenomenon.? It is in fact true, in the sense that it constitutes a historic event of great importance, which has still not fully evolved, and from which we still have much to learn. Nevertheless, this is not an inexplicable or fortuitous occurrence, and to understand this it is necessary to observe the process of political accumulation and struggle that has been developing in the university movement in recent years. 2014: A plenary assembly of UNA students “No more sections in the Faculties” to denounce the cases of proceedings against students and critical teachers and a march against the election of Froilán as Rector of the UNA. Also the mobilizations of the Permanent University Assembly against increases in public transport fares. 2012: Occupation of the Rector’s office of the UNA as a means of struggle against the imminent approval of the Higher Education Law (LES for its Spanish acronym), undertaken by the Student Front for Education (FEE). In addition, marches against the LES and demonstrations in front of Parliament during that year. 2011: Mobilizations of the Social Articulation for Education, against the LES. Also the struggle and resistance for the historic demand for de-annexation of the Social Work Institute, in this case from the Faculty of Philosophy, where there had been authoritarian interference by the Dean of this faculty and groups close to her administration (the same Dean whose resignation is now demanded). 2008: Occupation of the Central Campus of the Catholic University of Asunción and of the Aula Magna, against the designation of José Antonio Moreno Ruffinelli, who was protagonist and ideologue during the dictatorship of Stroessner, as Rector of the entity, and against the imposition of authoritarian Statutes. 2006: Occupation of the Central Seat of the Catholic University of Asunción, against the imposition of authoritarian by-laws. 2006: Occupation of the Rector’s office by students from various faculties, against a modification of the by-law that allowed authorities indefinite reelection. This modification was made without consultation by the Consejo Superior Universitario (university governing board – the same one that today is being unmasked for corruption). This brief account of the university struggles of the past ten years aims to show that in reality what we know as #UnaNoTeCalles is part of the development of the University Movement over the last decade, and very probably constitutes a synthesis of what will be the renovation of this organized sector and of its traditional structures. And it is not too much to say that this recent process forms an organic part of the historic development of previous student struggles, and struggles of the whole people, although we will treat the latter in another article. 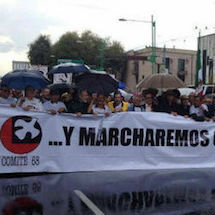 We must insist on this, #UnaNoTeCalles is not a matter of chance, but rather the product of a permanent, systematic activity of apprenticeship, based on errors and successes; an activity with the difficulties inherent to any serious effort to organize and claim rights denied by the current system, but in continuous movement. It must be understood that here we have only mentioned events of a broader character that marked these ten years, that in some way constitute moments of synthesis, since there have been more local processes of construction and more immediate struggles, all against the education system and its form of government. All of them looking ultimately to structural change. In the analysis of the protagonists: “We are seeking to build real student power, we cannot delegate this to other bodies. We have had enough of people making decisions for us. Our work consists in creating tools for organization, to reach a point where the student movement is no longer an instrument of some external force, we are looking for a genuine union organization”, as student leader Ana Portillo declared, from the Catholic University, which supports the mobilization at the UNA. Arturo Cano complements this: “If there were not a base that has undertaken a process and was determined to realize this action, this would not have been possible. In addition, if we have done this, we have done it because we were sure that we have men and women capable of leading democratically and with solidarity what is being done in the framework of these actions and in the wider process of change in the University. This is organization, beyond whether it is visible or not, in reality it is contained in the process, we were prepared for this scenario because we know the corrupt system that exists in the institution, for years we have been denouncing this. This is sustainable work, we are convinced of this”. The corruption at the UNA has been denounced for some time by the student direction of the Student Front for Education (FEE) and for even longer has been a reality known to the whole student body. In this context, a newspaper with national circulation began a series of publications bringing to light the facts of corruption and nepotism perpetrated by the former rector, Froilán Peralta: relatives designated without any criterion of merit and aptitudes, astronomical salaries, chairs on the pay-roll that were not developed, summary inquisitions of students and teachers. The journalistic investigations were the drop that overflowed the glass and served as the motive for the student body, who have been suffering the consequences of a decayed educational system and that moreover brought with it many experiences of struggle and organization, and had grown in strength and in quality. 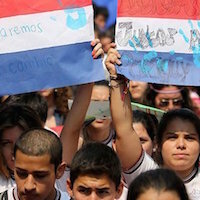 But in addition to this organized base in the student sector, another of the causes that explain what is happening in the UNA has to do with divisions among the powers-that-be, especially within the present governing party, the Asociación Nacional Republicana (ANR), that many students understand explains the series of articles published in one of the mainstream national media outlets, in order to reveal the corruption of the rector. This also explains the lack of political support for the dismissed rector and his circle of accomplices. A third element — in addition to the organization of the students and the internal affairs of the ANR — that generated the conditions for this mobilization of #UnaNoTeCalles, was the generalized frustration of the students with regard to the precariousness of the system, while the authorities enjoyed discretional use of the funds destined for education, as well as a natural rebellion against their then (supposed) representatives and pseudo student leaders, who instead of representing the genuine interests of their companions formed (and still form) an organic part of the putrid system of the university. It is in this context that we should also situate the basic elements that explain the popular support for these demonstrations of #UnaNoTeCalles. In Paraguay there is an overwhelming situation of economic crisis, intensified poverty and a government oriented to favouring big foreign capital and a small number of landowners and wealthy merchants in the country, while the 99% suffer miserable conditions. On the other hand there was a great support for the demonstrations of #UnaNoTeCalles from the students of the Marcha Nacional de Colegios Públicos and Privados (National March of Public and Private Secondary Schools), who on September 18, under the slogan #ElSilencioNoEsNuestroIdioma (silence is not our language), packed the streets with a march of over ten thousand people, with the support of teachers unions, organizations and collectives of the university movement and parents. The movement is planning to take the actions and the resistance further in every faculty through the democratic exercise of student power, following up on the fiscal interventions to investigate cases of corruption and pressuring for the resignation of Deans, functionaries and corrupt and repressive professors who are still accommodated to the old structure. In this way the University Movement, as a part of the struggle of the great majorities of Paraguayans to shake off the relics of the Stroessner dictatorship and of the system of oppression that has retarded development for decades, has erupted, in these beginnings of the XXI century, with renewed breath, with legitimacy and perspectives of moving forward. 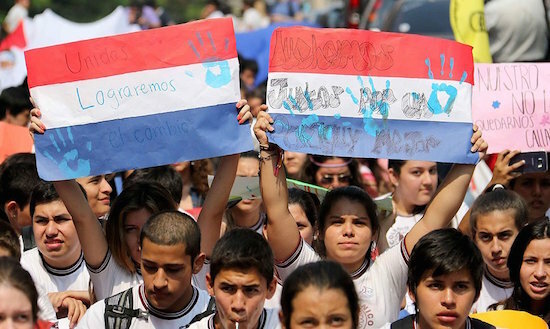 To continue to harvest victories, to unite forces; since change is coming and the Paraguayan people are with the students. (*) In the next article we will look into other aspects of the movement #UnaNoTeCalles, with an analysis of the protagonists and an investigation of the immediate perspectives of these struggles.